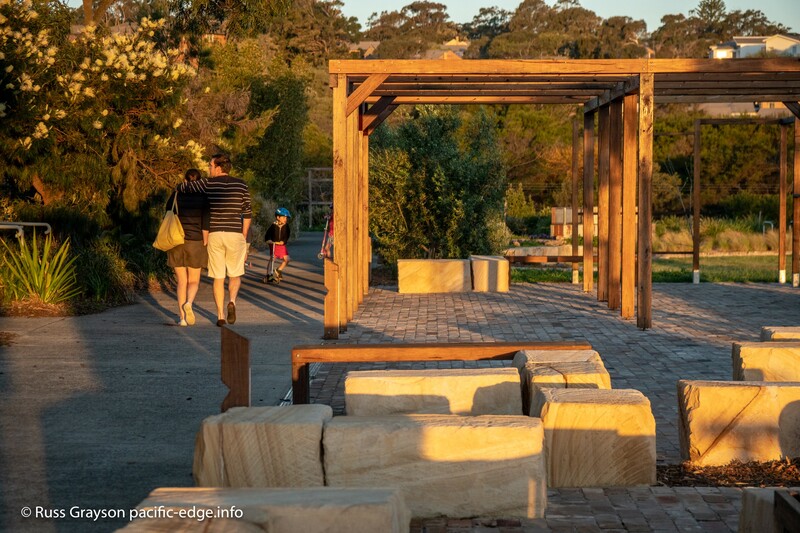 The sandstone seating and pergola of the Meeting Place glow with the rich light of late afternoon. This necessitates making links between the parts of a site. What are the functional relationships between them? How do people move from one to another? What are the main movement corridors and what are the minor? How do people move from inside to areas outside a building? These were the questions facing the permaculture-trained designers of the Meeting Place plaza when they started the project. 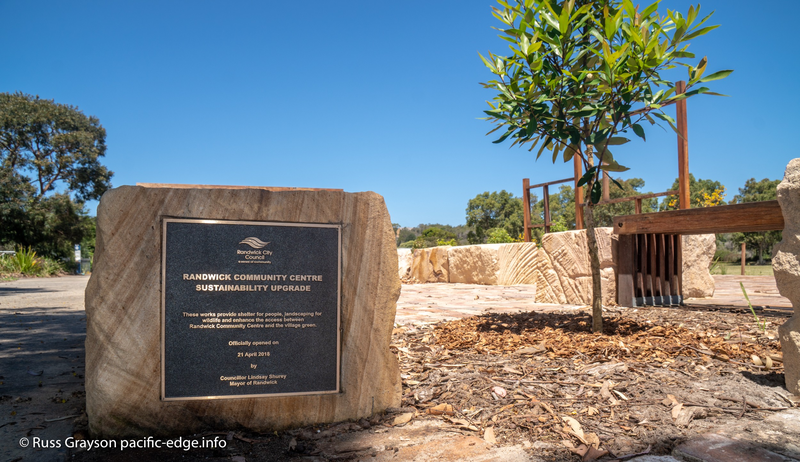 The Meeting Place is a small plaza, pergola and associated landscaping that forms the public entrance to Randwick Community Centre. Designing public places is different to designing backyards and other small works that are the usual extent of permaculture designs. Permaculture design courses do not train students to the level required for public place development. The design course certificate is not the professional qualification local government and other institutions require, that of a landscape architect. An up-to-date knowledge of materials and processes in landscape design is required. So is detailed knowledge of the design criteria for public places such as the Australian Standard for paths/gradients/disabled access; for cycleways and shared paths; stairway construction; construction and finish; and worksafe practices. Public places need paths of sufficient width, surface and gradient. Gathering places need to be of sufficient scale to accommodate the maximum number of people anticipated. Seating needs to be in the right place. Materials need to be chosen for durability, low-maintenance and aesthetics. There is much to consider. Fiona Campbell, local government sustainability educator who hatched the idea of building the Meeting Place and secured funds. The Meeting Place plaza with sandstone block seating and newly-established trees. These will grow into shade trees which will provide a welcome coolness during the heat of summer. Vines already planted will cover the pergola. The building in the distance is the Classroom used for council’s resilient-living courses and workshops, and which uses a significant quantity of reused and recycled building materials in its construction.. The framework at right will hold interpretive signage. The design process starts with defining client needs and, in relevant projects, a user or community consultation/design participation process. Understanding the site comes next. This is acccomplished through a process known as site analysis. the open space of the Munda Street Reserve. The site is in the warm temperate zone of Sydney’s Eastern Suburbs within two kilometres of the beach and sandstone cliffs of the coast. The annual temperature range is from a rare low around 12°C to 40°C in a heat wave. Summer temperatures span an average mid-twenties to mid-thirties. exposure to the cooling, summer afternoon sea breeze from the north-east. The site was previously military land, including use as the logistics centre for the Allied navies in the Pacific during World War Two. Prior to European settlement the region was home and sustenance to Aboriginal people. The redesign had to address deficiencies in the original design and landscaping that had become apparent over the years since the site was opened in 2007. Site navigation: Previously, visitors found difficulty in locating the entrance to the community centre and other installations beyond on site. There was a lack of wayfinding signage. Shelter: Visitors had no sheltered place where they could sit and wait for their workshops or activities to start or to socialise with friends. Relationship between components: There was no clear, unimpeded link between the halls of the community centre building and the open space beyond. Access was blocked by a barrier of dwarf crepe myrtle trees. With their branches at and just above head height, there was the potential for people to injure themselves. The dwarf trees were a visual and physical barrier between the building and Munda Street Reserve. Biodiversity: The crepe myrtles formed a botanical monoculture lacking lower-level planting. They were forage to bees when in flower, however the design of the new landscaping will establish a range of biodiverse flowering plants which will provide forage over a longer period. Maintenance: The paving in what is now the Meeting Place plaza, installed when the site was first developed, allowed weeds to grow between the pavers, necessitating maintenance and consuming council staff time. Amenity: With the vegetation originally planted and with only a single park bench seat below a few adjacent water gums (Tristania spp), user amenity of the area was minimal. There was no place to sit and socialise nor to await workshops and events in the community centre. The redesign and reconstruction of the space between the community centre building and Munda Street Reserve has to address the deficiencies of the original design. Site navigation: A roofed noticeboard, which also harvests rainfall and directs it to a soak, and which includes lighting, was constructed at the western end of the Meeting Place plaza. Located adjacent to the car park, it marks the entrance to the site. Framework for interpretive signage has been installed on the edge of the plaza and, when they are ready, will be fitted with signs explaining elements of the local environment. Shelter: Young, Australian native trees adapted to the hot dry summer climate and sandy soil have been planted. These will eventually provide shade. The pergola has been planted to a deciduous vine that will provide shade in summer and, when it loses its leaves in winter, will allow the sunlight to warm the paving and provide a warm microclimate. A row of native, lemon myrtle trees (Backhousia citriodora, a bushfood used in flavouring food and making lemon-flavoured tea) have been established in the landscaping to form a windbreak from the cold, blustery southerlies in winter and to offer shade in summer. Young lemon myrtle trees will grown into a substantial windbreak and provide shade as they grow. The development of the Meeting Place plaza opened the interior of the community centre to the exterior environment. It allows easy access to the outside seating area and the open space of Munda Street Reserve. 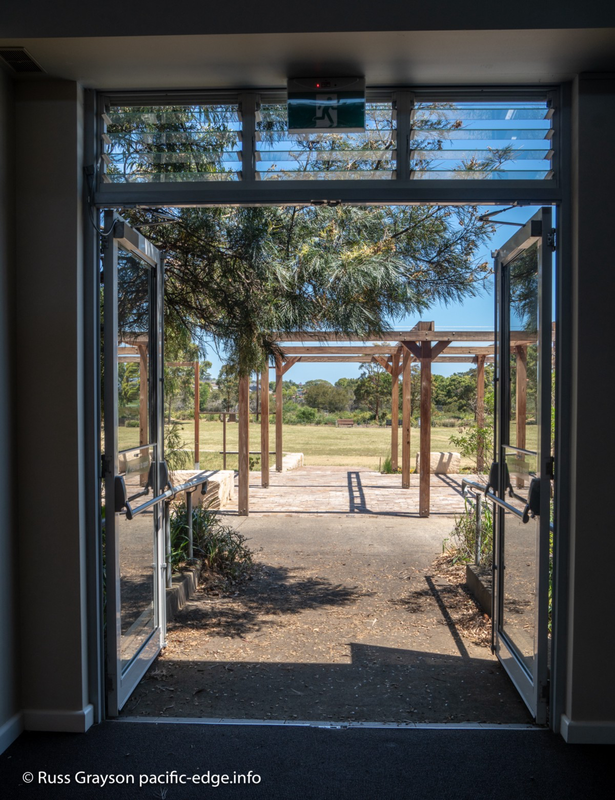 Relationship between components: The design of the Meeting Place opens the community centre halls to the open space of Munda Street Reserve. It provides a spill-out space for workshops and has already found use as such as well as by people using the space for sitting, talking and relaxing. Biodiversity: The removal of the dwarf crepe myrtles is compensated by the planting of new, more botanically diverse landscaping that includes Australian trees which will grow to cast shade and form a windbreak for the Meeting Place. 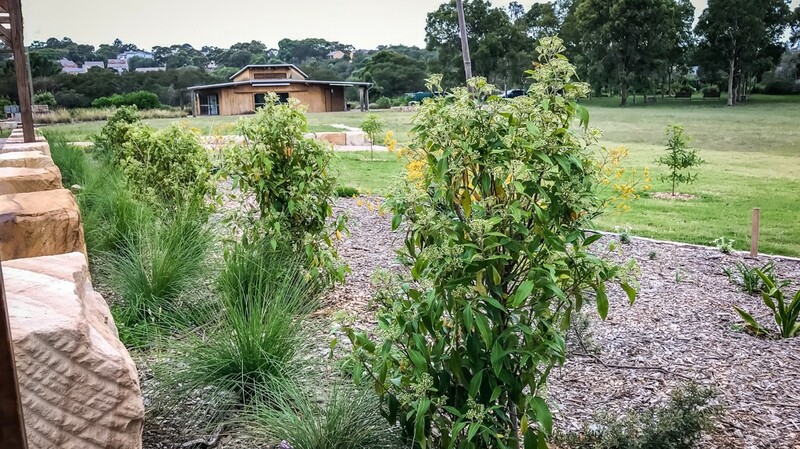 The landscaping includes flowering species of benefit to the bees in the Sydney Bee Club’s nearby hives, for the varieties of native bees in the park and for the other insects and small birds that make up the ecological food web around the Munda Street Reserve. Species were selected for adaptation to soil and climate so as to minimise maintenance. Maintenance: Reused brick paving minimises weed growth between pavers and provides a durable, easy-to-maintain surface. The use of Australian native plants adapted to environment and soils will see a reduction in garden maintenance requirements as it grows. Amenity: Amenity is a cornerstone design need for public place projects. 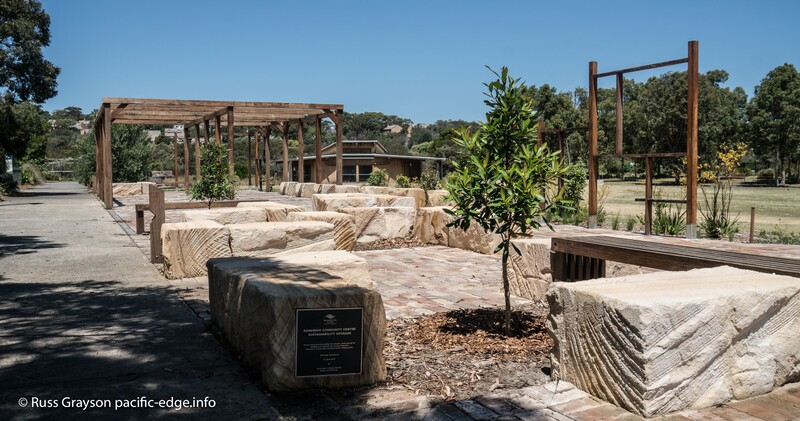 The installation of new park bench seats, the sandstone block seating of the Meeting Place plaza and the pergola and, when they reach suitable height, the trees, offer the public a quiet sitting and gathering space, improving the usability and amenity of the entire Randwick Sustainability Hub development. 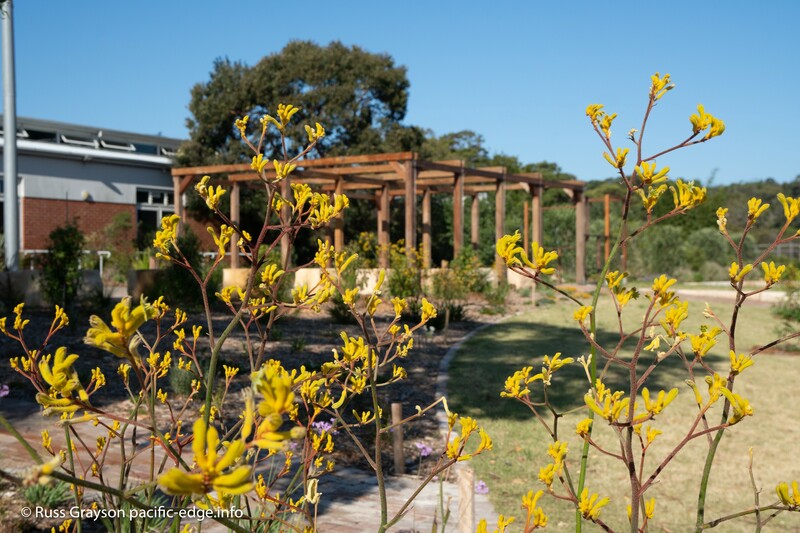 The bright yellow of Kangaroo Paw, a native flowering shrub adapted to dry soils and climate, frames the pergola of the Meeting Place. Designers of public places get used to criticism from some members of the public. Usually, it comes from people who sound as though they know a lot but who usually know little. That is what happened when the dwarf crepe myrtles were removed. Seeking to blacken Randwick Council’s reputation, the objectors told the local newspaper the removed vegetation was ‘magnificent’ trees when, in fact, the tallest would have reached three metres at its highest twig. They went on to criticise other works at the Randwick Sustainability Hub and demonstrated the worse bad and aggressive behaviour by what we know as NIMBYs — Not In My Back Yard. Trees in cities are magnets for local politics and displays of emotion. Environmental campaigners have surrounded them with a mythology which situates them as fixtures in the landscape. In reality, they are temporary. Trees have a finite lifetime. They are subject to pest and disease infestation, to damage by vehicles, vandals and weather. Sometimes they require removal. The local NIMBYs recruited an organisation called Saving Sydney Trees which earlier opposed the removal of large native figs to construct the new light rail lines from the city to the Eastern Suburbs (new trees, possibly kauri pines, have since been planted). Saving Sydney Trees issued an emotive statement in defence of the dwarf trees and chose to ignore the fact that council was to establish a more-diverse landscape including large shade trees and flowering plants of habitat value to wildlife as part of the Meeting Place development. They also ignored the social value of the project. The crepe myrtle incident demonstrated what permaculture people in other circumstances have said of environmentalists and permaculture practitioners having diffrent agendas. Where environmentalists want to keep things the same through conserving what is there, permaculture practitioners want to improve environments. This can involve removing what is there so as to make those improvements. It comes down to a ophilosophical difference between the two. Environmentalism is about preservation. Permaculture is about development which has, as an outcome, improived environmetnal conditions. It is an integrated design system and so includes people as well as nature in its designs and developments. I have seen NIMBYs try to stop other permaculture and commuity garden developments. They have a misplaced sense of ownership that mentally privatises what is public infrastructure and attempt to exert their beliefs of what should happen to it, ignoring the needs of others and the merit of the project. There is much for permaculture designers and advocates to learn from this incident, especially who it is they choose to support and what their agenda might be. The recently-planted landscaping will grow into a valuable habitat for bees, insects and small birds. The dish drain at left takes rain water from the wayfinding noticeboard structure at the entrance to the Meeting Place plaza to a soak, where it infiltrates the sandy soil to the aquifer below. There is still work to do. The framework for noticeboards and wayfinding directions was installed during construction of the Meeting Place. The noticeboards will be installed when their design and manufacture is finished. That at the entrance has recently been installed. The Meeting Place is the final construction phase of the community centre/Randwick Sustainability Hub/Munda Street Reserve project. 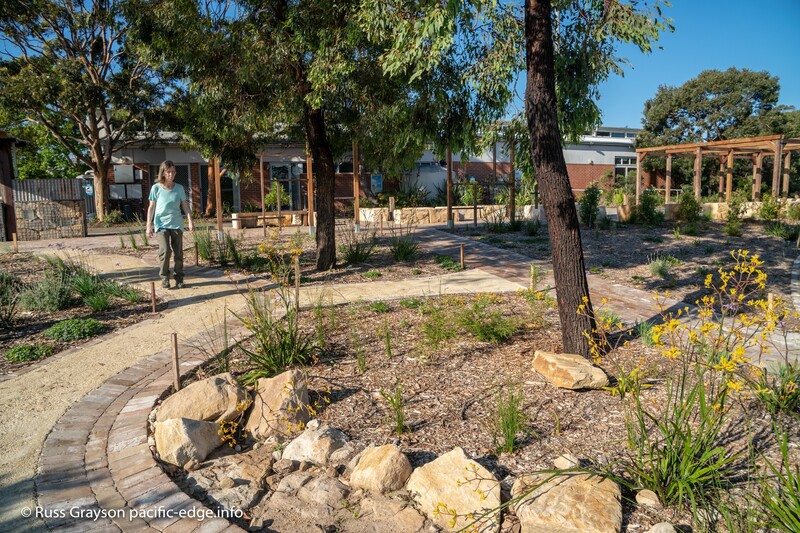 With development given direction by the public participation events not long after the community centre was built, the project, the work of permaculture designers, is now a multiple-purpose regional park in Sydney’s Eastern Suburbs. Permaculture is a platform of ethics and principles upon which its practitioners build useful apps… RG. If you’ve disguised your revolution as gardening too well, for too long, you may in fact just be gardening… Rafter Sass Ferguson. That’s what we’re doing in history; call it the invention of permaculture. By permaculture I mean a culture that can be sustained permanently. Not unchanging, that’s impossible, we have to stay dynamic, because conditions will change, and we will have to adapt to those new conditions, and continue to try to make things even better — so that I like to think the word permaculture implies also permutation. We will make adaptations, so change is inevitable… Kim Stanley Robinson.